Much has been said of the smug arrogance, cultural aloofness and end-of-history conceit characterizing the neoliberal Washington Consensus, the philosophy that a one-size-fits-all set of “good policies” (e.g. 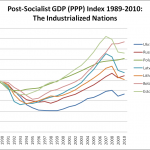 privatization, liberalization, deregulation) and “good institutions” (e.g. patent and IP protection system, etc) can – and must – be transplanted onto any country, irrespective of its historical or cultural traditions, if it were to ever join the developed “international community’. The general bankruptcy of this approach is evident from the facts on the growth, with global GDP growth during the 1960-1980 period of “bad policies” substantially higher than during the “good policies” 1980-2000 period. After seeing high growth during the earlier period, Latin America stagnated, and Africa and Eastern Europe declined during the latter; the major exception was mercantilist China. Though always disabused by reality, from 1998 Russia to the 2008 crisis, the neoliberals retain their intellectual underpinnings by continuing to claim, like Marxists, that history itself is ultimately on their side – after all, did not Britain and the United States, the world’s greatest economic successes, rise to global preeminence through the virtues of minimal government and free trade? 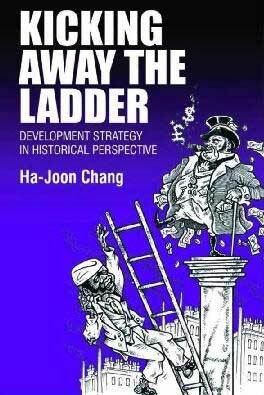 Not at all, argues Ha-Joon Chang in this excellent book. Take the example of Britain, alleged to be the historical laissez-faire state par excellence, in stark contrast to the stultifying dirigisme of Colbertist France. This is actually an inversion of the truth, for the French state was generally laissez-faire and backward-looking in the period between the end of Napoleon’s Continental System and the post-WW2 years (after which the state began large-scale interventions in the French economy, which experienced burgeoning growth that saw it overtake Britain’s GDP by the 1970’s). On the other hand, Britain was highly protectionist up until it established and cemented its global industrial predominance by the middle of the 19th century. British protectionism has a long history, stretching back to medieval import substitution designed to foster an indigenous wool manufacturing industry, instead of being reliant on raw wool exports to Europe. Henry VII tried to change this by taxing raw wool exports and poaching skilled workers from the Low Countries. This kick-started the industry that would come to constitute the key element of British industrial supremacy in the 19th C.
In 1721, Walpole expanded on previous Navigation Acts to encompass mercantile measures like lower tariffs on raw materials imports, duty drawbacks on the imported raw materials used for exports, the removal of export duties, the raising of duties in imported manufactures, export subsidies and a system of quality control to maintain the reputation of British exports. The colonies were treated as captive markets and resource appendages to fuel the commerce and industry of the mother country, by measures such as the 1700 ban on (better-quality) Indian calicos, which (possibly) stifled an incipient Indian industrialization. Britain fine-tuned the terms of trade between the US colonies itself to discourage industrialization in the latter, even resorting to overt illiberal measures like outlawing rolling and slitting steel mills on the American continent. It is a very common clever device that when anyone has attained the summit of greatness, he kicks away the ladder by which he climbed up, in order to deprive others of the means of climbing up after him. In this lies the secret of the cosmopolitical doctrine of Adam Smith, and of the cosmopolitical tendencies of his great contemporary William Pitt, and of all his successors in the British Government administrations. Any nation which by means of protective duties and restrictions on navigation has raised her manufacturing power and her navigation to such a degree of development than no other nation can sustain free competition with her, can do nothing wiser than to throw away these ladders of her greatness, to preach to other nations the benefits of free trade, and to declare in penitent tones that she ha hitherto wandered in the paths of error, and has now for the first time succeeded in discovering the truth. The factory system would, in all probability, not have taken place in America and Germany. It most certainly could not have flourished, as it has done, both in these states, and in France, Belgium, and Switzerland, through the fostering bounties which the high-priced food of the British artisan has offered to the cheaper fed manufacturer of those countries. It was only in 1860, by which time Britain’s status as the workshop of the world was unquestioned, that it truly transitioned to a free-trade regime with the Cobden-Chevalier Treaty with France. Yet during the next fifty years it was undermined by German technological prowess and American economies of scale, and was obliged to reintroduce substantial tariffs in 1932 under the stress of the Depression-era protectionism scramble. 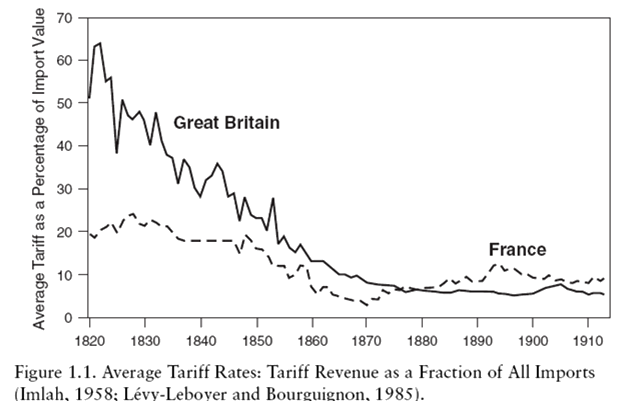 [International tariff rates 1820-1950, taken from Google Books]. What about the US, then, today’s champion of free trade? This is an ironic position for it to take up, given that in the years after the Civil War and prior to the Second World War, America was the protectionist nation par excellence. The “infant industry” theory was invented by Alexander Hamilton, the first Treasury Secretary, and the American economist Daniel Raymond. With its history of being held as a resource appendage and captive market by the British and spurred on by the War of 1812, protectionism was firmly established from 1816. A US Congressman, a contemporary of Friedrich List, said of British liberal trade theory, “like most English manufactured goods, [it] is intended for export, not for consumption at home”. President Ulysses Grant, a Civil War hero, remarked of it, “within 200 years, when America has gotten out of protection all that it can offer, it too will adopt free trade”. So the populist right-wing politician Pat Buchanan makes a perfectly valid point when he condemns free trade as being un-American. Ha-Joon Chang stresses the importance disputes over the proper level of tariffs played over the start of the US Civil War. The crux of the matter was that northern industrial interests wanted high tariffs to protect themselves from British competition, whereas the South, which had no industries of its own and an idle, rapacious elite, wanted lower tariffs to make British goods more affordable. There were frequent spats on this matter from the 1830’s; slavery only provided the fuse. (Chang points out that Lincoln was deeply racist by modern standards and only emancipated the northern slaves in 1862 as a strategic move against the South). Lincoln’s top economic advisor, Henry Carey (described by Marx as the only American economist of any significance), argued that British free trade was an imperialist ploy to consign the US to a future of primary production. Following the North’s political and military triumph, US tariffs between the Civil War and World War Two remained the highest amongst those of any industrial power, with the sole exception of Russia. As with its British imperial predecessor, the American superpower only ditched free trade once it achieved a global industrial dominance made possible by the wartime devastation of its European competitors. 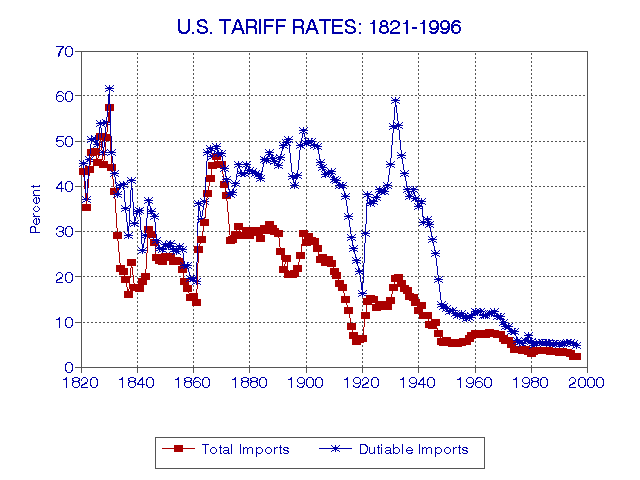 Though tariff rates are now very low, the US somewhat compensates with voluntary export constraints, (textiles) quotas, agricultural subsidies, and unilateral sanctions against countries suspected of dumping, so it remains far more protected than Britain was during the Victorian Golden Age of globalization. Likewise there is extensive state support for R&D, which enabled US success in hi-tech areas like computers, the Internet, aerospace, and biotech. There were some exceptions like the Netherlands and Switzerland that have maintained free trade since the late 18th century. However, these were countries that were already on the frontier of technological development by the 18th centuries and therefore did not need much protection. Also, it should be noted that the Netherlands deployed an impressive range of interventionist measures up till the 17th century in order to build up its maritime and commercial supremacy. Moreover, Switzerland did not have a patent law until 1907, flying directly against the emphasis that today’s orthodoxy puts on the protection of intellectual property rights (see below). More interestingly, the Netherlands abolished its 1817 patent law in 1869 on the ground that patents are politically-created monopolies inconsistent with its free-market principles – a position that seems to elude most of today’s free-market economists – and did not introduce another patent law until 1912. Contrary to the conventional wisdom, it was the open economies that failed to develop rapidly. Not much chance for European colonies / captive markets to develop an indigenous industrial base under the constant, unchecked pressure of superior European competition. Semi-independent countries like China and the Ottoman Empire were paralyzed by “unequal treaties” capping tariffs at a 5% flat rate and loss of tariff autonomy (Ha-Joon Chang points out that today the World Bank recommends a maximum 15-25% tariff rate, low and uniform, despite that the development differential between today’s poor and rich countries are vastly greater than they were a century ago). Finally, industrial leader nations (like Britain) tried to stymie the growth of competitors by preventing the outflow of skilled workers in the 18th century, machines in the 19th century, and enforcing intellectual property rights in the 20th century. [Britain] did not have universal suffrage (it did not even have universal male suffrage), a central bank, income tax, generalised limited liability, a generalised bankruptcy law, a professional bureaucracy, meaningful securities regulations, and even minimal labour regulations (except for a couple of minimal and hardly-enforced regulations on child labour). As such, the rich would should moderate their unrealistic demands for the developing nations to instantaneously reform their institutions to world standards. It is a difficult process that took centuries in the NDCs themselves, and besides in some cases the poor countries would be better off spending that money on other things. For instance, would it be better for Gabon to spend its (very limited) resources on hiring legions of (foreign) intellectual property lawyers to ensure a modern IP environment, or should it spend them on training its own primary school teachers? Tough choice, right? As Tainter teaches us in The Collapse of Complex Societies, complexity isn’t always all it’s cracked up to be. The “official history” of capitalism has been highly distorted by neoliberals with little appreciation of economic history, either maliciously, or because of their ideological blinkers. 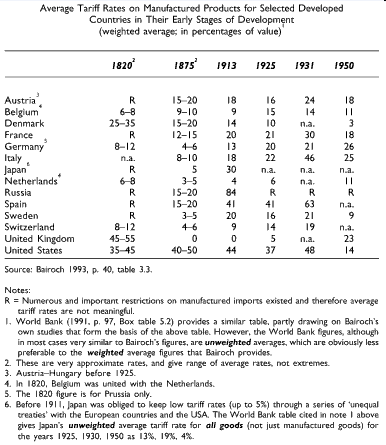 The reality is that even today’s stalwarts of free trade and liberalization only got to the top though blanket protectionism and intelligent state intervention, a tradition that has been carried on by the East Asian tigers (Korea, Taiwan, etc) – the only major non-Western nations to successfully industrialize after Japan. After they had industrialized, the new leader nation – in modern times, the US – has an interest in creating a global free trade system which could reinforce its hegemony. The poachers become the gamekeepers. The climbing followers become leaders kicking away the ladder. However, uninterrupted free trade does eventually undermine even its guarantors. Last century, it was Germany challenging Britain. 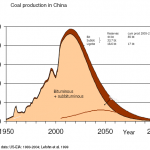 Today, it is China challenging the US. Leveraging its cheap, docile and decently-educated labor force, China used the window of opportunity thrown open by US trade policy to build up the world’s premier industrial base – as of now, it produced around half the world’s steel and cement. Though it’s economy is ostensibly relatively free-wheeling, China having ditched central planning three decades ago, in practice the state remains extremely active in building up infrastructure, improving human capital and industrial espionage. It couldn’t care less about intellectual property rights, given that it has almost none of its own to protect (you don’t need innovation when you’re at the point when you can just buy or steal the next technological levels), giving it a further competitive advantage. The sheer comparative advantage it has built up in manufacturing means that overt protectionism is simply unnecessary for it. 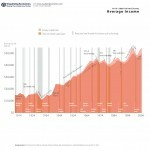 Open trade has led to the steady deindustrialization and “hallowing out” of the US industrial base, which no longer maintains a positive balance of trade in any manufactured goods category, with the marginal exception of (heavily-subsidized) aerospace. (The effects in some European countries have been as bad, e.g. Italy’s traditional artisanal manufacturing destroyed by cheaper Chinese competition). The US machine tool industry, the heart of any industrial ecosystem, has been decisively buried by European and Asian competition. 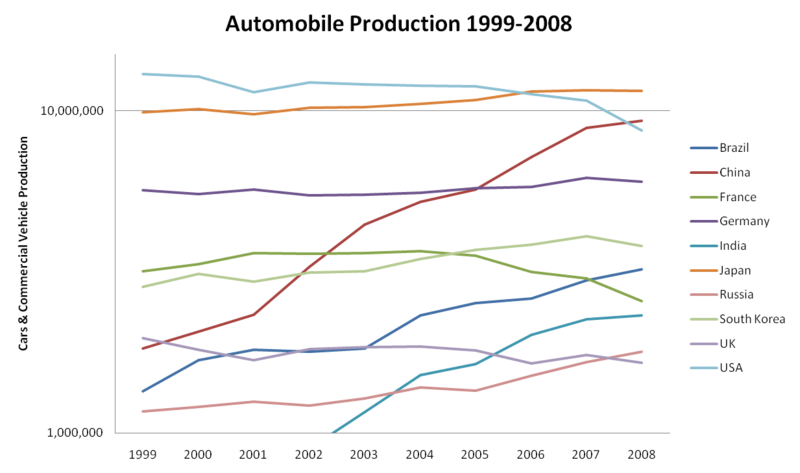 From 1999 to 2008, US automobile production declined from 13.0mn to 8.7mn units, while in the same period this figure rose amongst its main competitors like Japan (9.9mn to 11.6mn), Germany (5.7mn to 6.0mn), Korea (2.8mn to 3.8mn), and China (1.8mn to 9.3mn). The shifting winds of history are steadily unraveling Pax Americana‘s center of gravity, threatening to send the global system into a chaotic tailspin. The paradox is that though globalization sustained US hegemony, it also contained within it the seeds of its own destruction. America has overstayed in laissez-faire land, blinded by its own instruments of success to the dangers they pose to itself. Russia has an exceptionally strong need for protectionism and state intervention, on account of its traditional economic backwardness, highly unfavorable geography, and innate tendencies towards illiberal anarchy (in which nothing gets done at all). 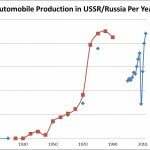 Hence the reason for the forward-looking, dirigiste industrial policy pursued under the Putin administration (special economic zones, clauses obligating foreign automobile companies to source a percentage of their parts from Russian suppliers, nanotechnology, etc) – and the likelihood that the state will resume its old rule as the main driver of the Russian economy in the unstable decades to come. A few criticisms of the book. It makes the blanket statement that growth was higher during the “statist” 1960-1980 period than the “open” 1980-2000 period, but fails to consider other possible factors behind it, such as: a) the end of hyperbolic growth in oil extraction, and more generally, energy production (energy and natural resources are indispensable and highly-neglected factors of economic growth) – i.e. the appearance of limits to growth to the global economy, b) the ebbing of the electro-mechanical / petrochemical cycle and c) the end of the Flynn effect (end of IQ rise), especially pertinent given that education is the elixir of growth. In other words, the scope of the book is rather narrow – state industrial policy as the be all and end all of economic development. That said, his arguments are intuitive and convincing, if not fully complete; though then again, I doubt comprehensiveness would have been one of his aims in a book of just 140 pages.